Description of artwork Roses are alway close to my heart. 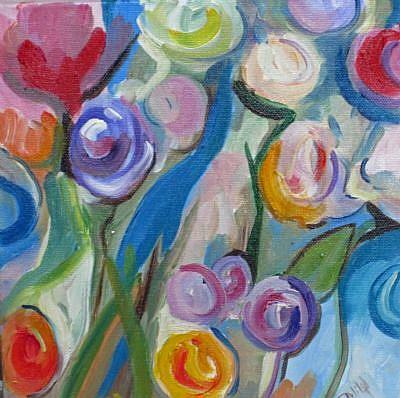 I have a large flower garden and I often paint form the garden but this was done abstract. This is an original oil painting done on gallery wrapped stretched canvas with painted sides. TITLE: Abstract Rose Garden This work has been clear coated to protect your investment Style: Abstract Size: 10x10 Colors: Blue,red,yellow,green,purple Depth: 1.5 Medium: oil Support: stretched canvas Shipping: -USPS Priority Ready to Hang: yes it may be hung as is. The sides are painted and the back is wired. Signature: Always Signed .